1. Xiaoxue W, Xi C, Zhibo X. Effects of botulinum toxin type A on expression of genes in keloid fibroblasts. Aesthet Surg J. 2014 Jan 1;34(1):154-9. doi: 10.1177/1090820X13482938. Epub 2013 May 24. 2. Wilson AM. Eradication of keloids: Surgical excision followed by a single injection of intralesional 5-fluorouracil and botulinum toxin. Can J Plast Surg. 2013 Summer;21(2):87-91. 3. Zhibo X, Miaobo Z. Potential therapeutical effects of botulinum toxin type A in keloid management. Med Hypotheses. 2008; 71:623. 4. Zhibo X, Miaobo Z. Botulinum toxin type A affects cell cycle distribution of fibroblasts derived from hypertrophic scar. J Plast Reconstr Aesthet Surg. 2008 Sep;61(9):1128-9. Epub 2008 Jun 13. 5. 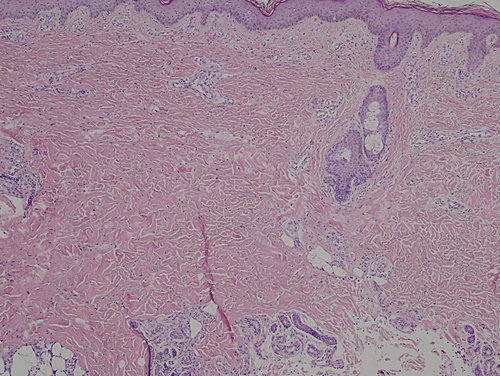 Witt E, Maliri A, McGrouther DA, Bayat A. RAC Activity in Keloid Disease: Comparative Analysis of Fibroblasts from Margin of Keloid to its Surrounding Normal Skin. Eplasty. 2008;8:e19.